We are excited to invite you to this year’s Scholastic Book Fair! Come experience a celebration of reading that provides families the opportunity to get involved in a universal mission: encouraging kids to read every day so they can lead better lives. 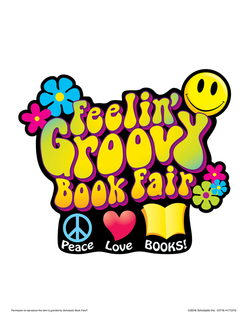 Our Scholastic Book Fair theme – Feeling Groovy – surrounds students in the celebration of reading with hundreds of fun, engaging, affordable books for them to discover. In addition to the regular Book Fair hours above, we will have the Grands Breakfast on Wednesday morning from 8:00-9:00am. This breakfast is for our Shepardson students and the GRAND adults in their lives. The school breakfast will be $1.75 per person. We will also have pastries and coffee in the Media Center. A separate flier for this event is attached so you can keep the date and time handy. One variation this year from previous fairs, is that we will not be having a family night. Because our school conferences have been moved to the week of the Book Fair to better accommodate our new trimester system, we will have extended hours during all three nights of conferences. We will stay open until 7:30pm on Tuesday, Wednesday and Thursday. This information and more can be found on the fair website: http://bookfairs.scholastic.com/homepage/shepardson. This site is also our Online Fair. In case you are not able to attend any of the Fair open hours or are unable to find a specific book at the fair you can shop at the online fair and have your books delivered to the school. The Online Fair is available for an extended time. And remember, all purchases, whether at school or online, benefit our school. We hope to see you at this year’s Groovy Book Fair! If you have any questions or for more information, please email the Book Fair Chairperson: Janelle McGill, janellemcgill@hotmail.com.